Last fall I planted two beds of sugar beets. We had a colder-than-normal winter, so they didn't do terribly well, but I did get some, and my harvest was better than my tries in years past. I pulled them all the other day in anticipation of preparing the bed to plant something else. Sugar beets make excellent livestock feed, which is my primary reason for growing them. Both the greens and the roots are edible, so I chopped some to feed fresh ad dried the rest for my goats' vitamin and mineral mix (the same one that the garlic leaves went in to). The goats got the smallest roots too, but with the larger once I decided to see if I could make beet sugar. In the U.S. "sugar" is a generic term that applies to both cane and beet sugar. Unless an ingredient list on a product label specifically specifies "cane sugar," then it could be either one or a mix of the two. Taste-wise it doesn't seem to make a difference, but all the commercial sugar beets grown here are genetically modified. So for those of us wishing to not eat GMOs, understanding that is important. Non-GMO sugar beet seed is still available to home gardeners, however, and that's what I planted. The directions called for finely chopping, shredding, or slicing the cleaned roots, placing in a pot, and covering with water. There were simmered until tender, about an hour. Then the cooking water was strained out and put in my crockpot to further cook down. The cooked beets are edible, so at dinnertime I sauteed some in butter to heat them up and we gave them a try. How were they? I thought they were good but Dan said he likes red beetroot better. The cooked beets can also be squeezed to remove more of the juice. Pulp would be welcomed by chickens and pigs! To make actual beet sugar, the cooking water must be cooked down until it crystallizes. Just like making maple sugar. The alternative is to cook it down to a thick syrup and use it that way. Mine cooked in the slow cooker for the rest of the day and was turned off at night. Early the next morning I fired it up again to continue cooking. By the following afternoon it was dark and still watery. But it was smelling sweet, so I took a tiny taste. And? Yes it was sweet but it also had a bitterish aftertaste! Yuk! That was all I needed to know and abandoned the experiment. could probably anticipate about a pint of syrup. Conclusion? Don't bother with making sugar or syrup; just use them raw for animal feed. In a hard times situation they certainly could be eaten by humans, and of course the greens are edible too. So there you have it. If anyone else has tried this with better success, I'd love to hear about it! I've often thought about using all the sugar beets that the sugar beet trucks leave laying all over my street. My home is on the path from beet field to beet weight station. They pile mounds and mounds of them right down the street from me. But after reading your blog post, I can see it isn't that easy to convert to sugar. Think I'll pass. Two thoughts come to mind. I thought the process was that it was cooked until it was a thick syrup (not until is crystallizes) and then the syrup was allowed to crystallize similar to old honey. Those crystals are then removed and crushed up like sugar. I wonder if the crystallization process would remove the bitter taste? The second thought is that with most other veggies that I can think, the bigger they are the more bitter flavors come through. Perhaps the best beets to make sugar are the smaller ones and not the big ones. I wondered about sugar beets. Amazon has Grandpappy's Recipes for Hard Times in paperback for $12.95. 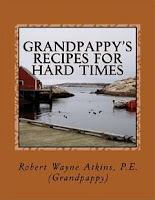 I checked out the Grandpappy's Survival Manual for Hard Times. Yeah - pricey. But really, do we who live in the country, have some yard/land/etc need as much advice as some people who will be in so much trouble that they will most likely die. City folk. The bigger the city, the worse it will be what with their first interuption of the food supply. You don't have to imagine further than that. I've never seen any 'survival guide' for a town, small city, med city or-- a megapolis. Only thing I've ever found is how to pack a 'bug out bag' -- and that bag is worn by people heading out to the country. THAT will be the biggest threat to everyone. That is when it will all go south, especially when they find that waving a wad of cash around buys them nothing. Let's just hope that things will never come to this. Meanwhile, hope for the best, prepare for the worst. I'm rooting for cool heads and common sense. Take care. Hope Dan's hand is healing up. Ed, those are good points. Grandpappy's book did mention quite a few folks just going to the syrup stage because crystallization takes so long. I guess it makes a good cooking syrup. I'll have to try mine in something and see how it tastes. Stephanie, I agree, the recipe book is very reasonable. But his survival manual is $79.95! He explains on his website that it's because it contains color pictures, which does make it more expensive. 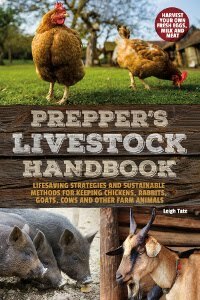 Kris, one of the Back To Basics Preppers Bundles that I was involved with had a few books on prepping in urban and suburban areas. Actually had quite a bit of good advice, But I skimmed over that one because we are fortunate enough to have a little land. Dan's hand is a whole lot better, mostly healed on the outside with a few scabs still and fingernails not whole yet. The one that got sawed off is pretty crooked and it's stiff. Some days it still hurts, especially when he works it more than usual. But he's a busy bee and just figures out workarounds so he can do everything he needs to do. 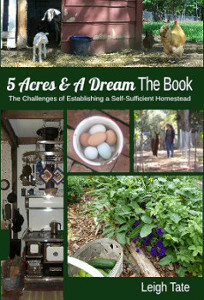 Leigh, one thing I have been able to grow but not to harvest the sap from (yet) is sorghum. There are some varieties that can have the stalks crushed and a syrup derived from them. On the whole, if one cannot grow cane sugar, keep bees - or trade with someone that does. Bettina, I'd completely forgotten about stevia. I know I would have to treat it as an annual until we get a greenhouse, but I might could still grow it in summer. I agree there may be a way to deal with the bitterish aftertaste of my sugar beet syrup. Just not sure how much energy I'm willing to put into it! TB, sorghum syrup is another one I'd like to try. I've grown it, so I know it does well here, but processing it would require some equipment I think bees are the best way to go! I hope to have another try at them soon. Leigh, I have kept two of my stevia plants over winter in pots in an unheated porch for several years in a row! ok, the temps don't go below freezing there, but the plants act like perennials - the tops die down and they grow back again in spring! so they don't really need light to survive and you could keep them in the bedroom window or such? I was wondering if the big "mangels" will grow down there. They have a red exterior and white inside, and were used a lot for livestock feed in northwest Minnesota years ago. Some of them were several pounds. I don't know if they would effect the flavor of the goats' milk negatively though. Anyway, I'm glad you actively participate in the learning experience with hands-on experimenting. Bettina, I could certainly try it! I know our winters are too cold for survival outdoors, but keeping a few plants in a protected room would be worth a try! Phil, I have grown mangels too. The goats liked them, but the never got very big, I think because of our heavy clay subsoil. I definitely plan to try them again. I had to chuckle because this seems like one of the only times I can recall you giving up on something! People around here talk about tapping their maples and poplars - it takes about 10 gallons of sap to make a gallon of syrup! Yeah, too much work for me. seems i rrad where the sugar beets are a main crop [n. dakoyta??] there is certain weather wherein they are to be processed. when the weather is announced over the radio everyone goes to his job and thet are all processed as long as that weather lasts. seems they are not fir otherwise. not sure if memory is correct. you might look into it. Deborah, that's interesting. I should look into it, although I have to say that I'm not sure all the work is worth it. :) At least not if I can find other sweetener alternatives.